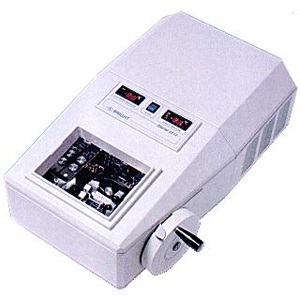 The Bright 2212 Starlet is a small, portable and convenient biological cryostat. The size of the Starlet makes it ideal as a back-up instrument or for use in laboratories where space is at a premium. Heavy enough to offer the needed stability, but light enough so it can be transported from laboratory to laboratory. If frozen sectioning is infrequent and a full-sized, full-priced cryostat cannot be justified, the Starlet does the job and fits any budget. The chamber is of stainless steel construction and comes complete with a detachable quick freezer bar and detachable storage shelf. Easy to clean and resistant to common decontaminating agents, the working chamber is convenient to use. Starlet cryostat’s compact size leads to rapid cool-down times, to -30°C in the chamber and to -40°C for the detachable quick freezer bar. While not in use, an insulated cover can be pressed in place to insure efficient running of the refrigeration system and reduction of frosting. 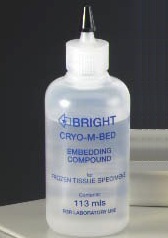 With the cover the chamber will remain cold for short periods while the cryostat is being moved. The microtome of the Bright Starlet 2212 has a unique radial, flat cutting design and can be operated by either a hand wheel or a lever. The microtome is capable of cutting a wide range of specimens including soft tissue, hair follicle, cardiac muscle and lung. The Magnacut disposable blade system is fitted as standard, using long-life disposable blades for quick results, and eliminating the inconvenience of knife re-sharpening. Complete with an Easi-Set anti-roll plate, the Starlet is fitted with a 2-12µm feed screw for sectioning in 2µm increments. A 4-24µm feed screw is available as an alternative. The microtome is easy to clean, resists corrosion and is easy to service - very little routine maintenance is required. 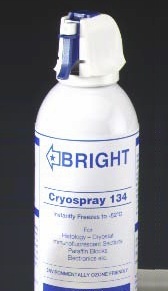 Bright OTF5000 floor model cryostats are also available from Rose Scientific.